I was awarded a PhD Enterprise Scholarship to test the commercial potential of a neurological deficit scoring system that I developed during my PhD. 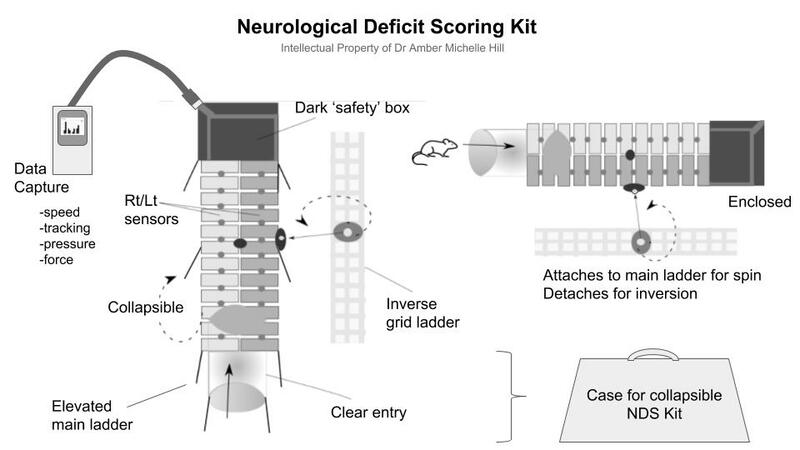 The neurological deficit scoring equipment was used to assess physical changes of neurological deficits (i.e. progressing disability) in pre-clinical models of neurological illness. The compact and creative design could potentially change the user experience for researchers investigating behavioural deficits pre-clinically. There are currently no fully functional kits available for testing all neurological deficit changes in the pre-clinical model of MS, and other diseases. To examine neurological deficits, researchers need to either build their own scoring system, or they need to buy or hire equipment. 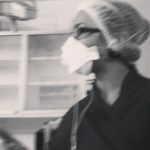 The current systems are often very expensive, complex to use, bulky or non-portable in design, difficult to clean and only measure one variable rather than all physiological deficits. This is not time or cost effective for researchers and there is little or no flexibility for researchers to vary their experimental design if necessary. A cross-disciplinary approach to develop the prototype. I met with an engineer from Interfleet Technology Ltd, an International Rail Consultancy group (which has since changed its trading name to SNC-Lavalin) and National Rail Engineering Consultant regarding my ideas for the ladder task portion of my kit. I was interested in engineering a miniature version of seismic railway sensors on the ladder task for tracking foot faults in pre-clinical models. The ladder task, and its complimentary inversion task measures fore-limb and hind-limb disability as well as tail tip weakness and paralysis. This task was previously manually quantified by counting foot faults, timing tasks and reflex ability. 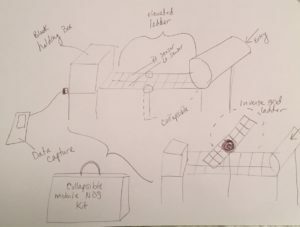 I developed and tested portable 10-point neurological deficit scoring kit designed to non-invasively quantify physical and behavioural changes of the nervous system over time. The design for automatic quantification mechanism using the load or force and speed of the steps as the ladder is crossed uses load sensors. The digital data capture was developed with a raspberry pi and several 16-way USB wheatstone bridges and adaptors to support the low-cost, portable functionality. The system is also easy to clean with multiple testing functions. The NDS kit’s mobility enables the use in an adjacent behavioural lab to an MRI scanner so that all procedures could be accomplished in the same area. It can also be made compatible with the MRI scanner for ease of multi-modal evaluation. The data acquired could be filmed with the raspberry pi camera and compiled to support histology and 9.4T MR imaging and spectroscopy that indicate microstructural changes that align with behavioural deficits. The NDS kit saves time and funding; it also offers more flexibility with experimental design and a greater range of quantification variables. It is a cost-effective alternative to bulky, very expensive, one-variable scoring equipment currently available on the market. Using the NDS scoring system, there’s a quantifiable increase in the sensitivity of scoring measures with minimal training for the pre-clinical models, improving the overall quality of research in this field. In the future, data collected on the NDS kit using its 10-point scale of neurological deficits in pre-clinical models can be translated to clinical systems. My PhD thesis utilises the data that I acquired with my kit. To find out more please contact Amber. “Amber has shown good promise in developing innovative methods to translate her research and improve the measure of neurological deficits pre-clinically.” – Professor Xavier Golay, former Head of the Department of Brain Repair and Rehabilitation, and Vice Dean of Enterprise, UCL.